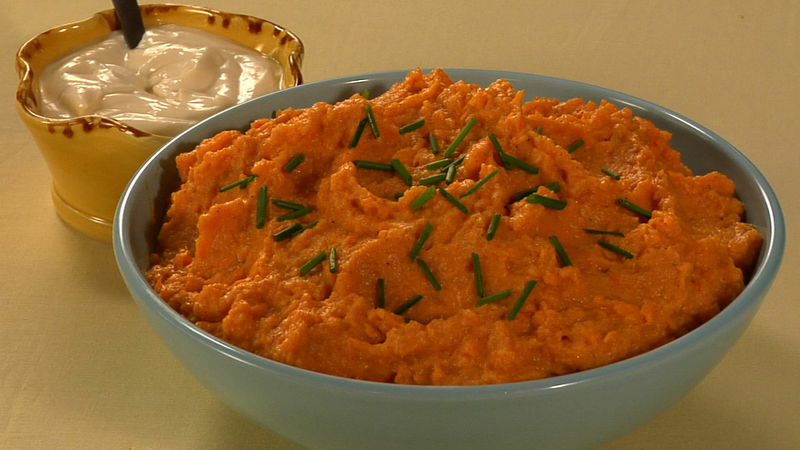 Place sweet potatoes in 4-quart saucepan. Add water to cover. Heat to boiling. Reduce heat; boil gently (simmer) about 12 minutes or until tender. Drain; return potatoes to pan. Add 1 cup of the Greek yogurt, the butter, 3 tablespoons of the brown sugar, the salt and remaining spices. Mash with potato masher until smooth. In small bowl, mix remaining 1/2 cup Greek yogurt and remaining 1 tablespoon brown sugar until smooth. Serve potatoes warm, topped with sweetened yogurt and chives.